A slow cooker makes this flavorful and versatile Mexican Slow Cooker Shredded Chicken recipe the perfect easy dinner recipe. The best kind of healthy recipe, in my opinion, is one that is easy and convenient to make. If a healthy recipe has a long list of difficult-to-find ingredients and directions that would confuse even Julia Child, it’s going to lose out to an easy-to-make unhealthy recipe (or just pizza delivery). That’s why I’m all about promoting healthy recipes that are simple, quick, and convenient. Bonus points if they cook while you’re away like this one! Slow cookers make cooking so convenient because you often just have to dump in a few ingredients, stir, and then wait for the magic to happen while you’re at work, running errands, or even sleeping. It’s kind of hard to call the pizza delivery guy when you get home and open up your slow cooker to chicken that looks like that. Oh, and your house will smell amazing thanks to the garlic, jalapeno pepper, hickory-flavored liquid smoke, cumin, chili powder, paprika, oregano, and cilantro. 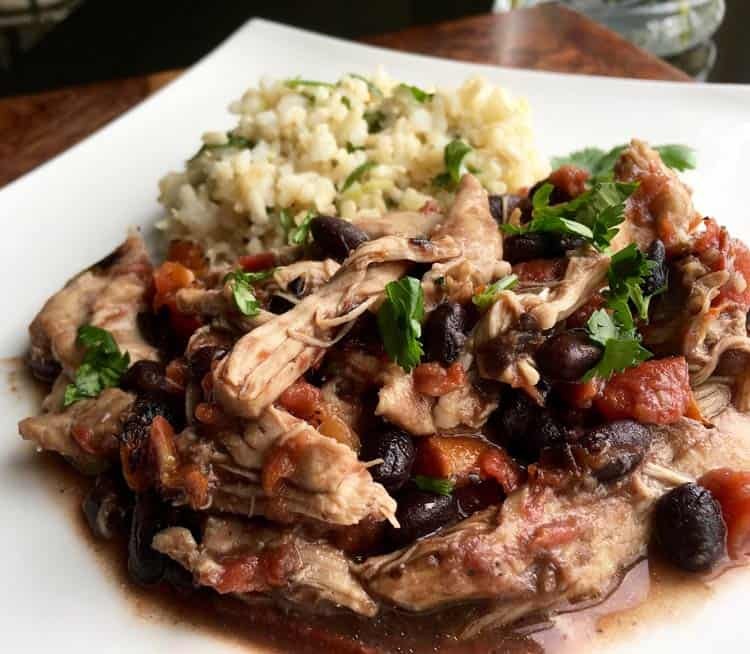 Not to mention the tomatoes, black beans, and chicken… it will be impossible to turn down. Reason #1: Mexican Slow Cooker Shredded Chicken is convenient to make. As I mentioned, cooking this recipe in the slow cooker makes it incredibly convenient. You only have to tend to it once: 30 minutes before the slow cook cycle is complete, you’ll need to open it up to shred the chicken. This lets the shredded chicken absorb all those unbelievably good flavors from the rest of the ingredients. But don’t worry, if you’re absolutely starving waiting for those 30 minutes to pass, you can enjoy some chips with homemade guacamole or our favorite Black Bean Salsa. Reason #2: Mexican Slow Cooker Shredded Chicken is healthy. For the chicken alone (rice not included), it contains only 375 calories per serving. It’s also low in fat (8.6 grams per serving) and has a whopping 40.7 grams of protein per serving! It’s a winner of a recipe that can be re-purposed to fit many different menu options. I want to quickly mention the hickory-flavored liquid smoke ingredient. If you’ve never tried cooking with liquid smoke, you may not be sure where to buy it, or you may be wondering if you can just skip it altogether. Please don’t skip the liquid smoke! Cooking with liquid smoke is easy and it adds an incredible flavor. Liquid smoke is actually a concentrate made from actual smoke; in this case, the smoke of hickory wood. Amazing, right? A lot of grocery stores and big box stores sell liquid smoke, or you can go for the ever-convenient option of buying it online. It’s not very expensive and a bottle will last you a long time! I hope you enjoy this easy, healthy, and versatile dinner recipe! Mexican Slow Cooker Shredded Chicken is a healthy and versatile recipe! Serve over rice, on a sandwich, or in lettuce wraps or burrito bowls. To the bottom of a 5- or 6-quart slow cooker crock, add unrolled chicken thighs. Save time with clean up by using a slow-cooker liner. Top chicken with the tomatoes, black beans, garlic, jalapeno pepper, liquid smoke, cumin, chili powder, smoked paprika, oregano, and cayenne pepper. Add salt and black pepper to taste. 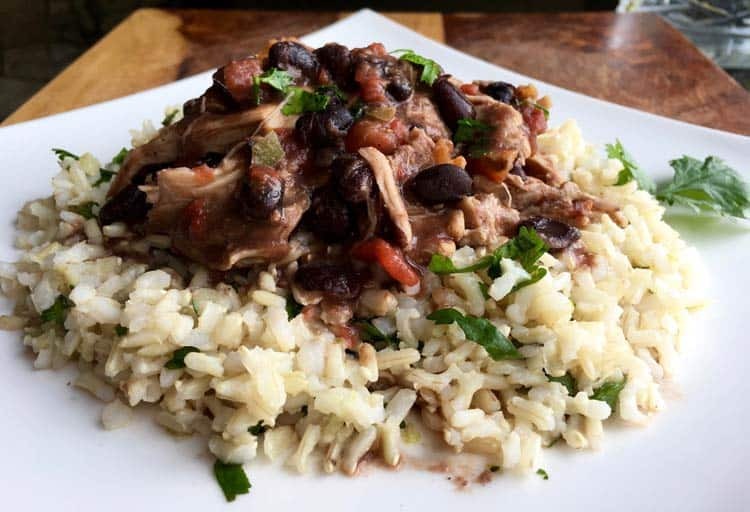 Stir to combine all ingredients in slow cooker. Be sure the chicken is fully coated and submerged in liquid. Cover the slow cooker and cook for 3-4 hours on high or 6-8 hours on low. 30 minutes before the cook time is complete, remove the lid and shred the chicken in the slow cooker using two forks. Stir to combine the other ingredients with the shredded chicken. Cover and cook for remaining 30 minutes. When the meal is done cooking, squeeze fresh lime juice on top while everything is still in the slow cooker. Add cilantro and stir to combine. Add additional salt and pepper to taste. 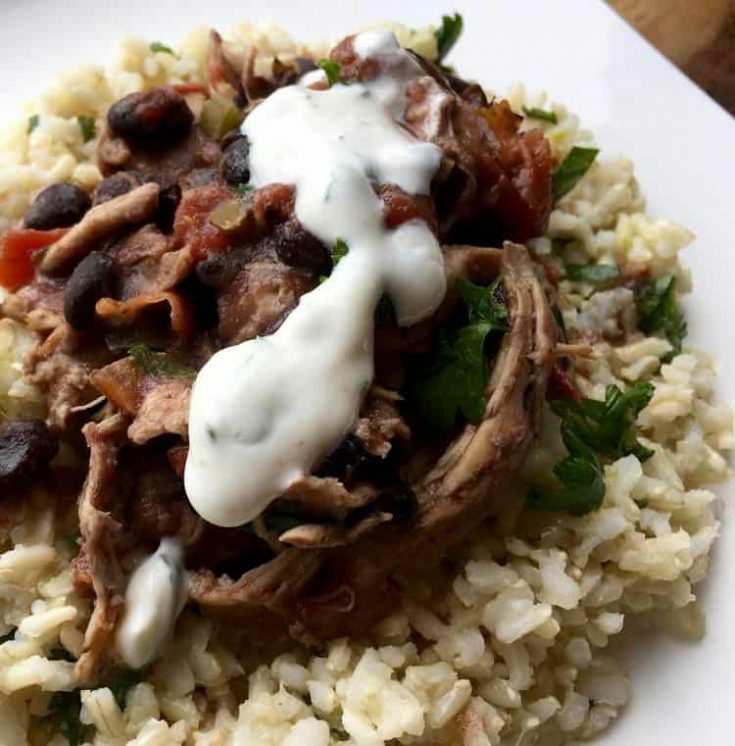 Chicken mixture can be served over plain brown rice or cilantro-lime brown rice and topped with cilantro-lime sauce. Or, chicken mixture can be served on a sandwich, in lettuce wraps, or in a burrito. Serve dish with remaining lime wedges. Tip: Don’t skip the squeeze of fresh lime juice when the dish is done cooking! It really enhances the flavors and brings them all together.